(PhysOrg.com) -- It is essential for roots to grow down so they can explore the soil and maximise their water uptake. But how they know that is a question that has fascinated scientists since Darwin. 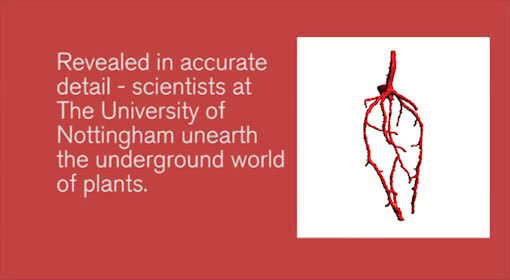 Now scientists led by The University of Nottingham have found the answer. Gravity profoundly influences plant growth and development. But after years of academic research the interdisciplinary team from the UK, Germany, France, Belgium, Sweden and the US has finally identified how that process happens. Their results have been published in the leading academic journal Proceedings of the National Academy of Sciences (PNAS). With funding from the Biotechnology and Biological Sciences Research Council (BBSRC), Malcolm Bennett, a Professor in plant science at The University of Nottingham and Biology Director of the Centre for Plant Integrative Biology, used newly developed technology to pinpoint what happens when plant roots decide to grow down and not up. He said: This research really demonstrates the value of an interdisciplinary approach to plant science questions. By combining the skills of mathematical modellers with experimental biologists we have a new range of tools with which to investigate root growth. Scientists have long speculated that plants bend in response to gravity due to the redistribution of the plant hormone auxin in the tip of the root. This study combined the newly developed DII-VENUS technology  another collaborative research project involving The University of Nottingham  with mathematical modelling to demonstrate that auxin does indeed redistribute when roots are turned through 90 degrees, but far faster than previously thought. This multidisciplinary approach reveals that auxin is redistributed to the lower side of a growing root within minutes of the root being turned through 90 degrees. It also shows that this gradient is rapidly lost as bending root tips reach a tipping point at an angle of 40 degrees to the horizontal. The formation and loss of the auxin gradient serves as an on and off switch for the root bending response. The auxin sensor DII-VENUS, recently published in the journal Nature, was used in conjunction with a parameterised mathematical model to provide a high-resolution map of hormone distribution through time. So we need gravity to grow plants in space. thats what i thought. I grew some tomatoes in a hanging upside down planter and the roots must have grown upwards since the plants thrived. Many roots simply follow the humidity gradient - for lianas it's much more effective approach, than the orientation by gravity. I had a bag of organic peat laying on the ground under a porch. The roots of a tree located 30 feet away managed to find a tiny hole in the plastic and grew UPWARDS into the bag. I went to pick up the bag and found nothing but roots in the bag. It consumed my organic peat almost completely. The experiments in lab are mostly done with young germinating sprouts, the growth of whose is driven with different feedback mechanisms, than at the case of mature plants. The roots of many trees ignore both gravity, both humidity gradient, as they're following the surface of soil instead. So that the trees should have a way more complex mechanisms for control of growth of their roots.